Finally planted the garden. Much smaller this year. 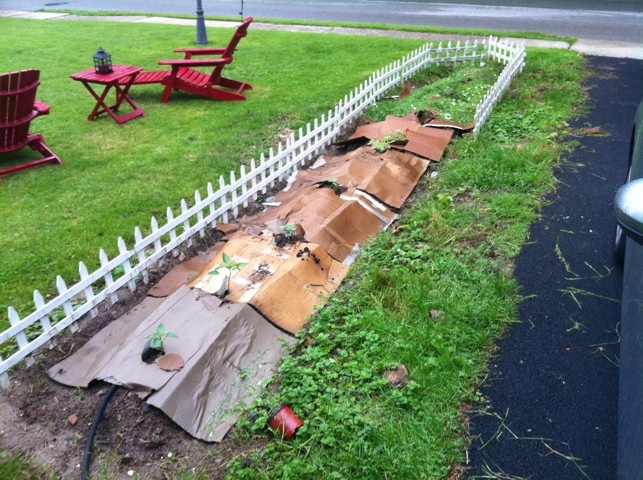 Anyone have an opinion on the use of corrugated cardboard sheets to control weeds? Ugly, yes, but effective? Discuss. If Mitt Romney is so great at starting and running businesses, then why doesn’t he? Enough, already. You won’t win, dude. Overall, a great weekend. Diners, long drives, and a visit to a dive. Best of all, it was spent with a great friend. Welcome back, Chase Utley. Please hit the ball. Hard. And often.